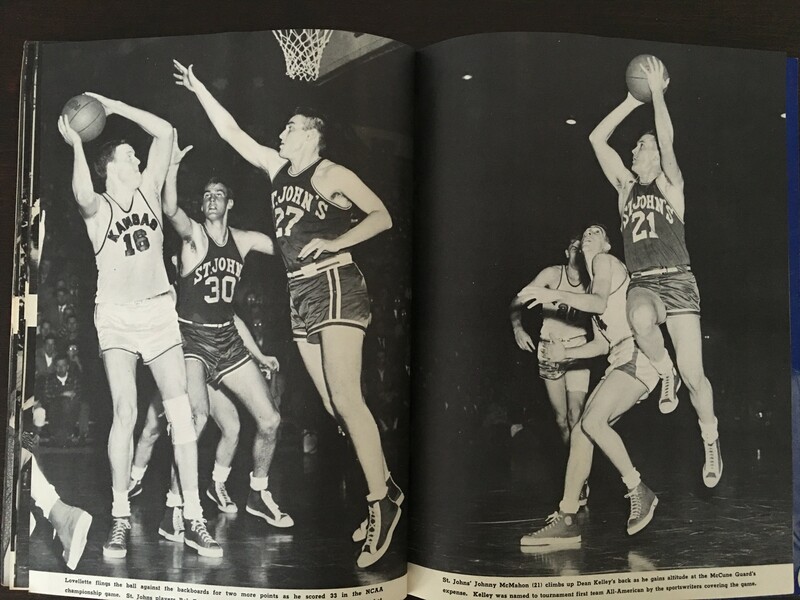 Originally from Indiana and recruited heavily by IU, the story goes that Phog Allen (at least in part) lured Lovellette to KU by telling him that the height on Mount Oread would be good for his asthma. 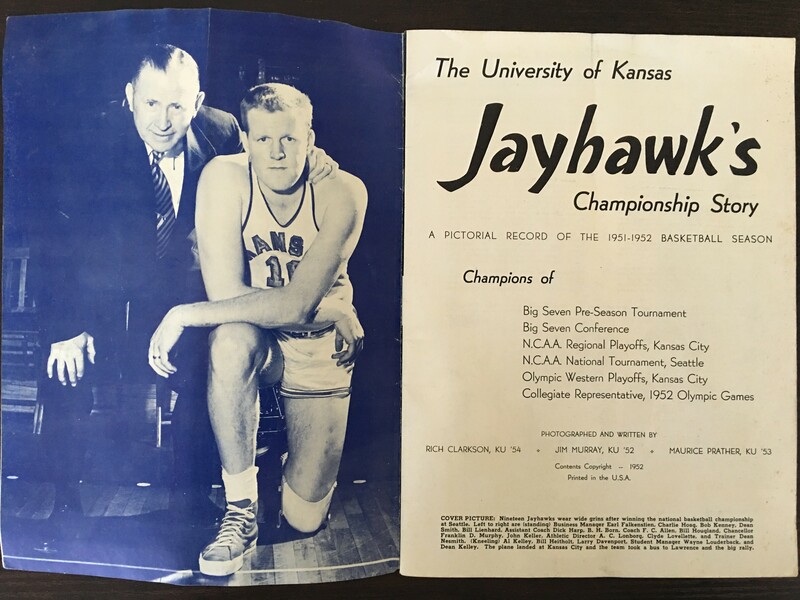 Yes, that Mount Oread – all 1000+ feet above sea level. 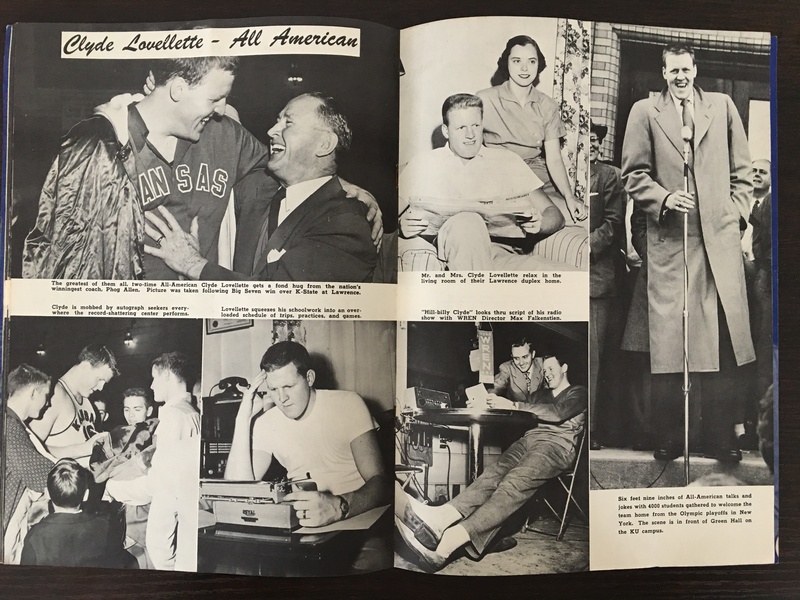 At Kansas, Lovellette accrued a variety of colorful nicknames, including: The All-American Alp, Altitudinous Asthamatic, Asthamatic Alp, The Campanile of the Courts, Cloudburst Clyde, Colossal Clyde, Cumbersome Clyde, Cumulus Clyde, The Fabulous Frenchman, Leaning Tower of Lawrence, Clyde “Mount” Lovellette, The Rampaging Redwood, The Superlative Sequoia, and The Terre Haute Terror. 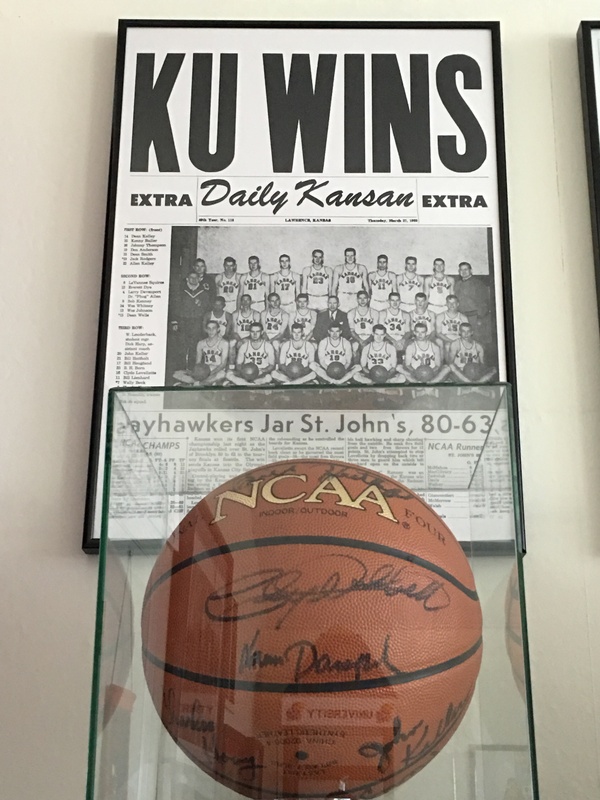 For most KU fans however, Lovellette will be known as a champion. 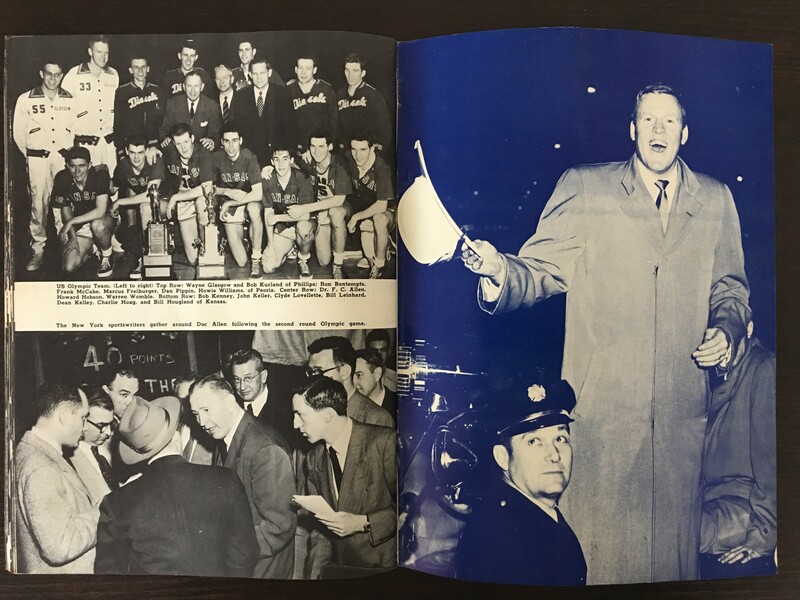 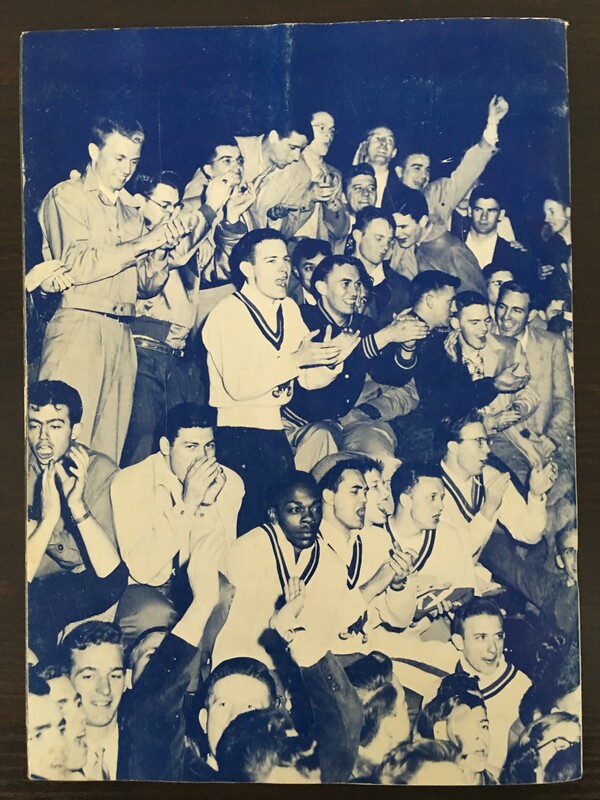 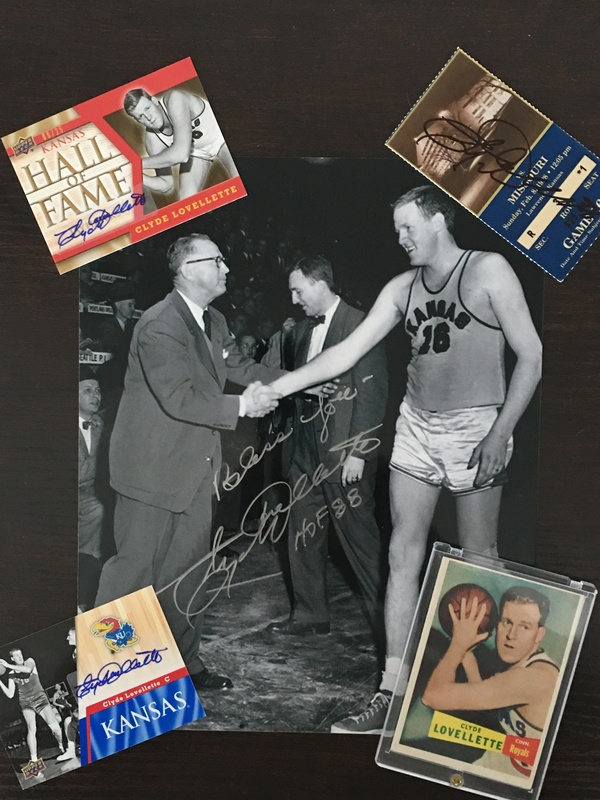 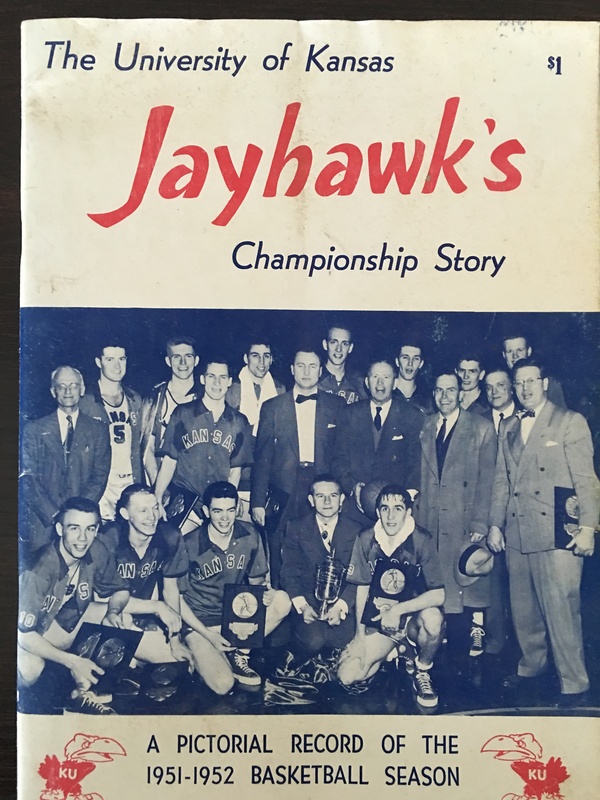 Beloved for leading the Jayhawks to the 1952 NCAA Championship and being named the tournament’s Most Outstanding Player, Lovellette helped to formally cement Kansas as a basketball powerhouse. 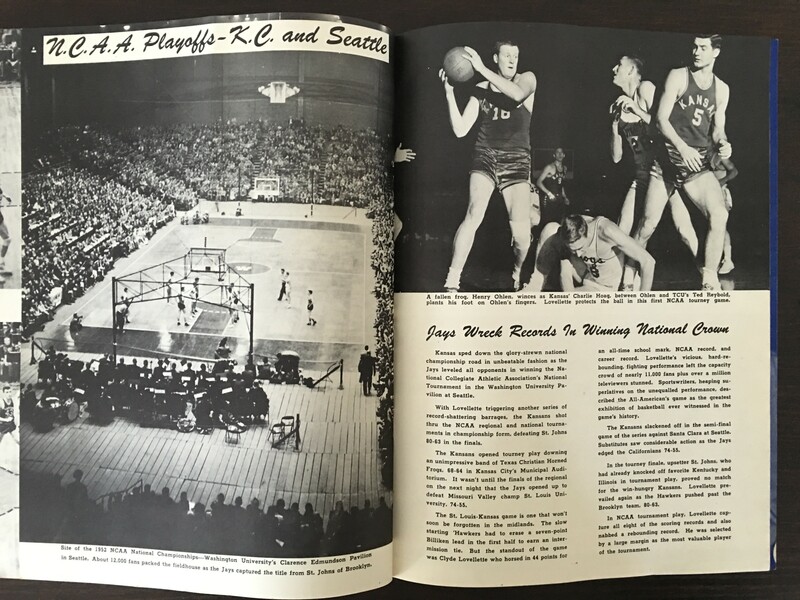 In addition, Lovellette played on the United States’ 1952 gold medal team, won an AAU title, and also won three NBA championships, becoming the first player to accomplish such a feat. 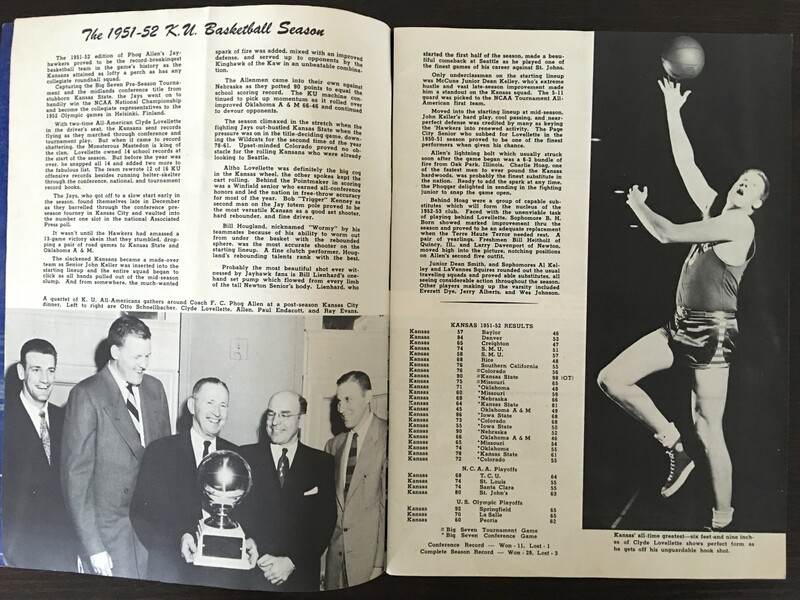 Nice to “e-meet” you, Cindy! 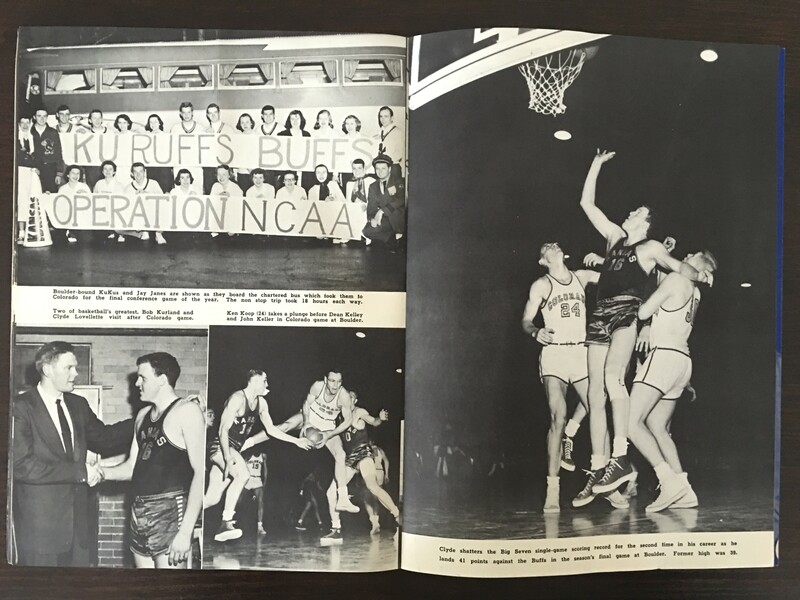 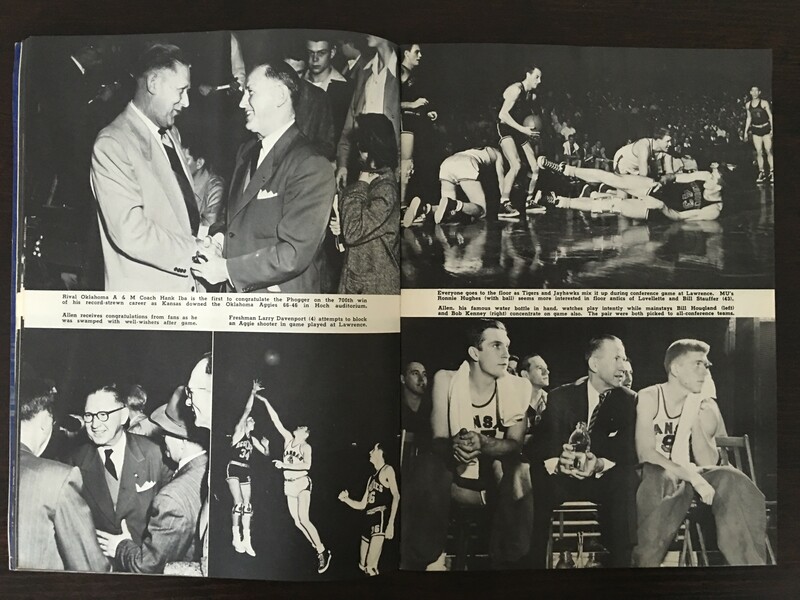 The pictures I have & posted are from a magazine published later in 1952 in celebration of the team. 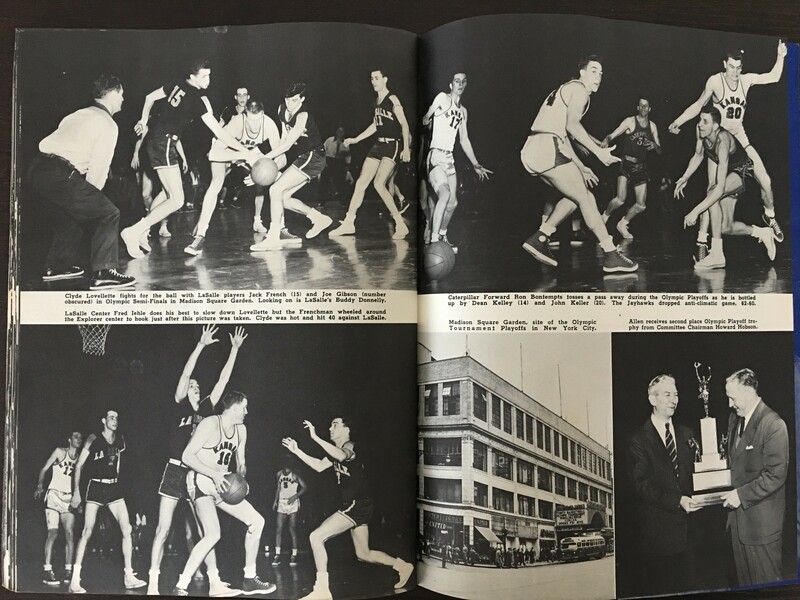 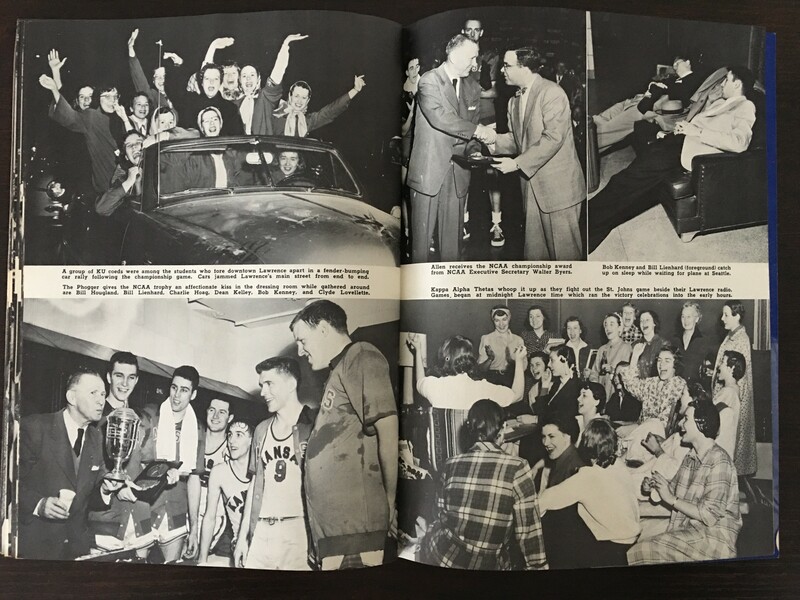 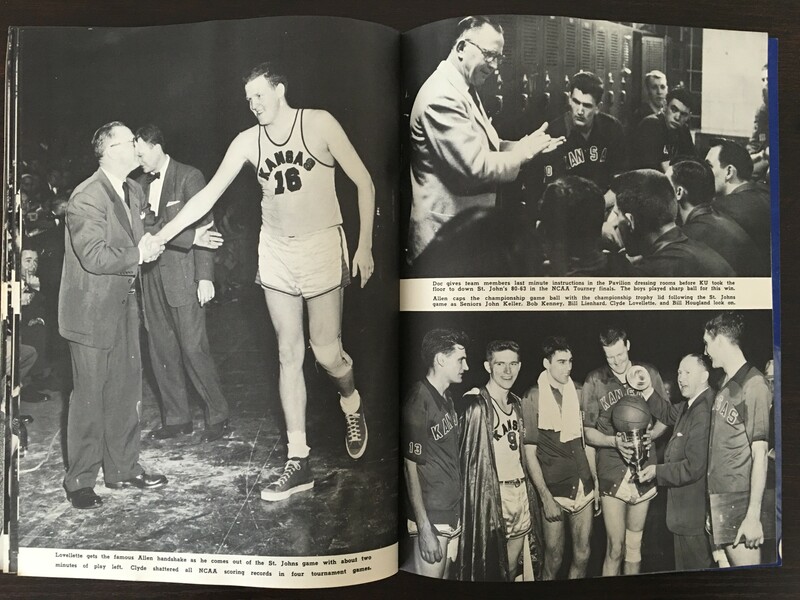 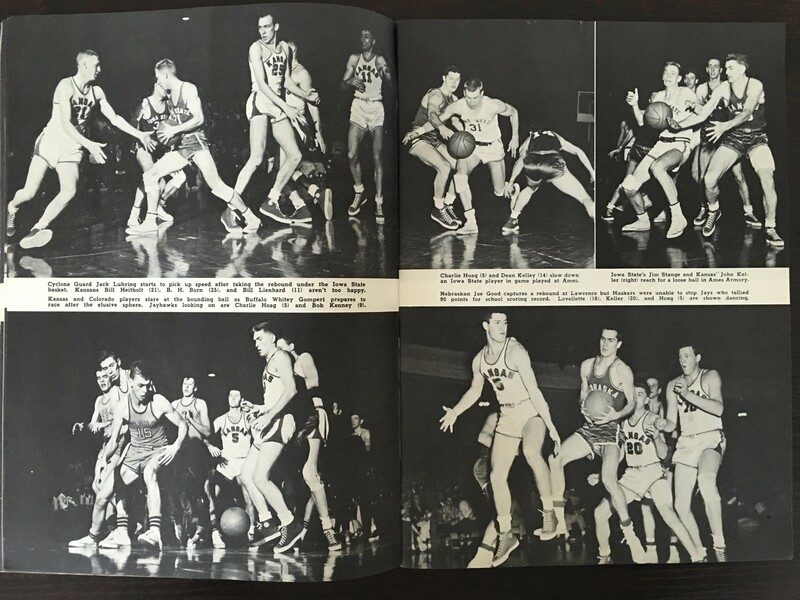 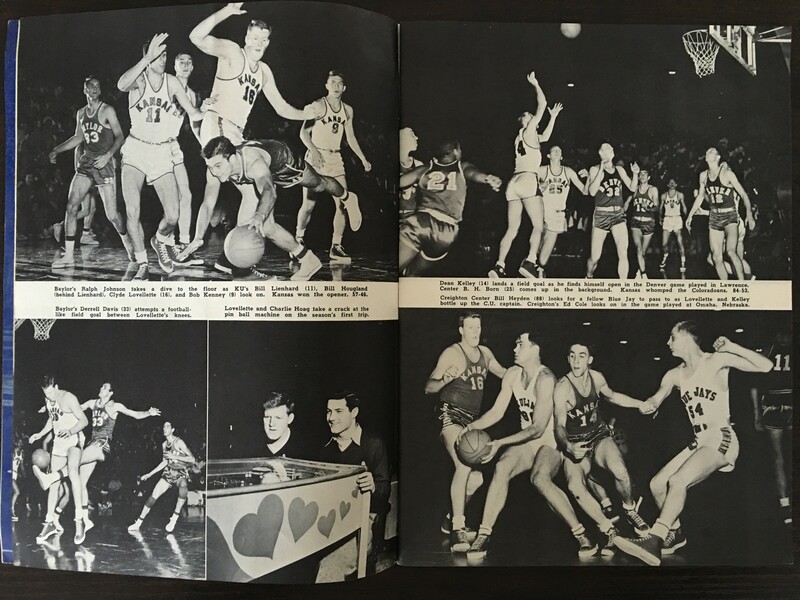 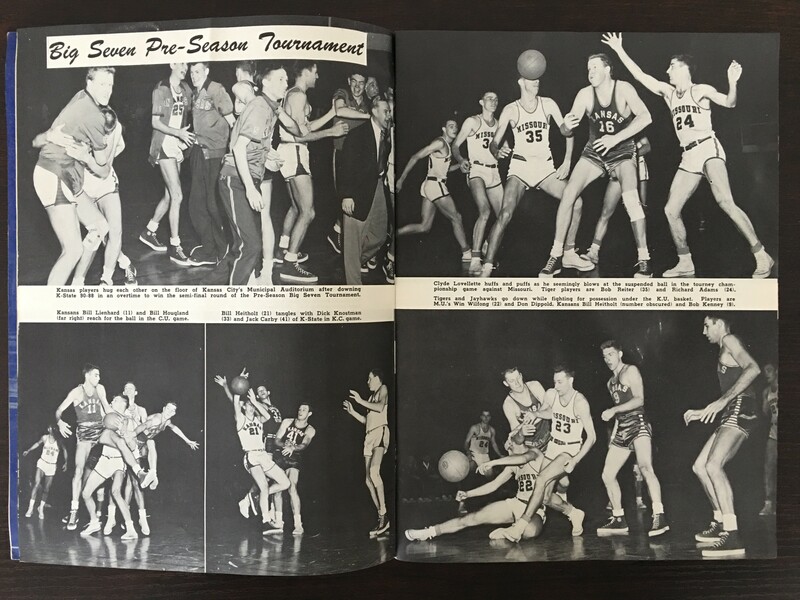 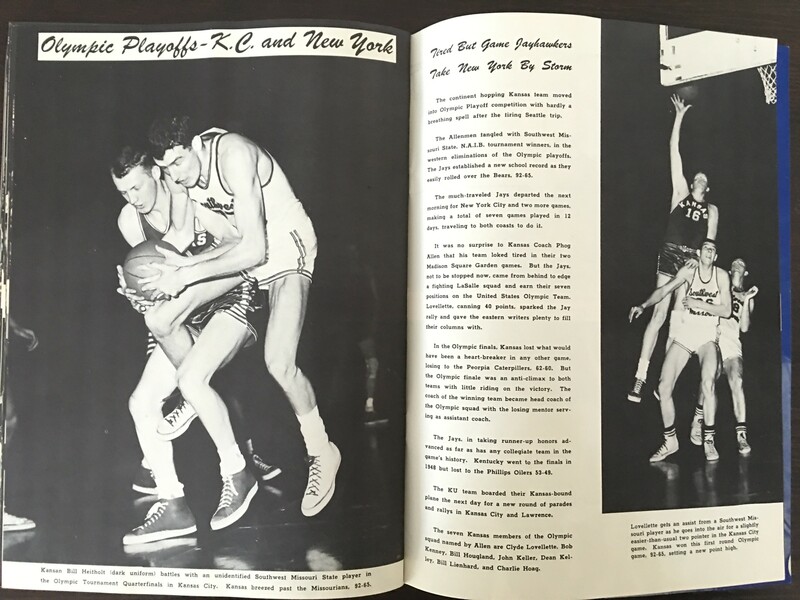 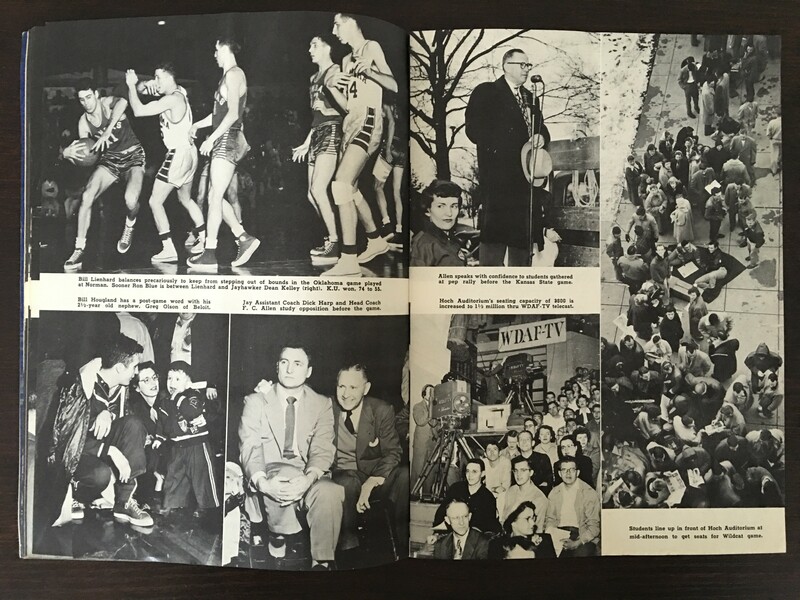 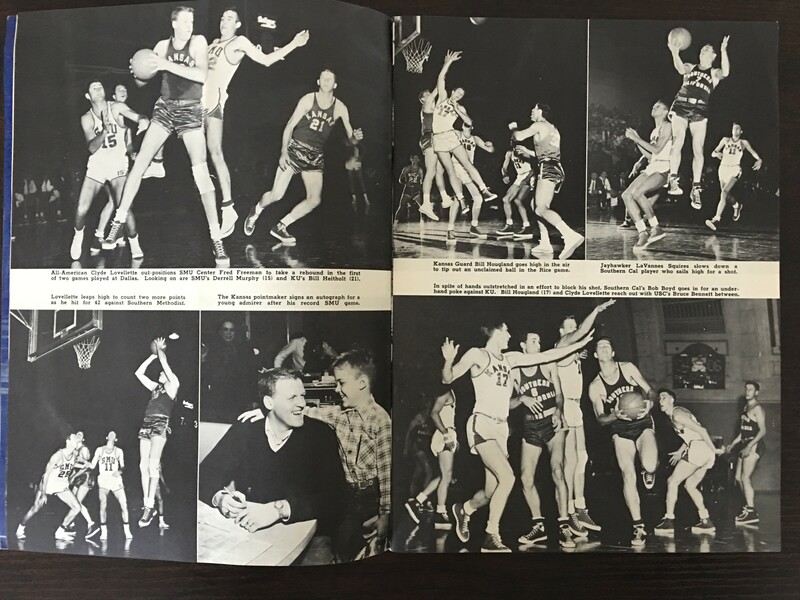 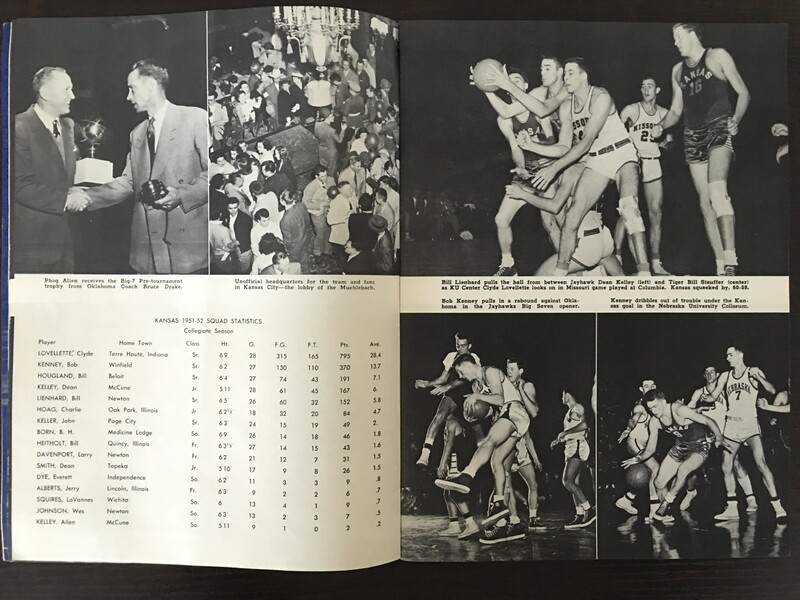 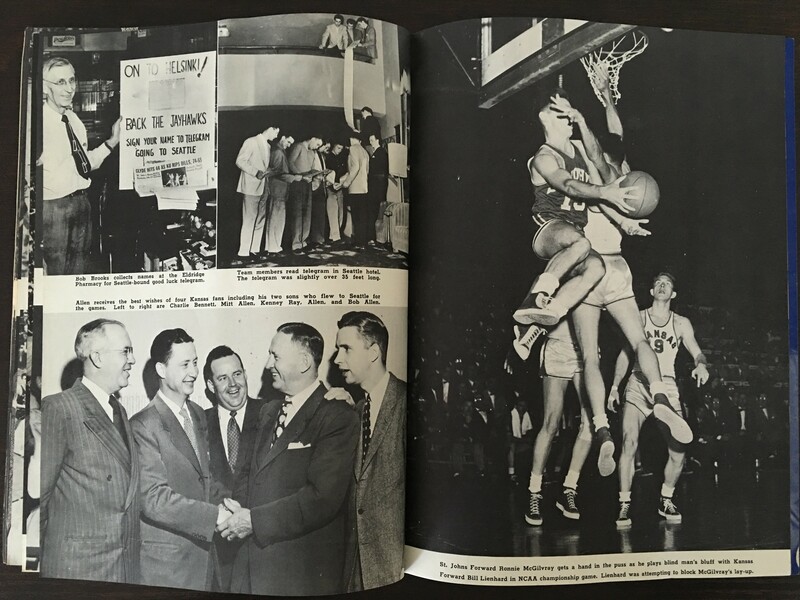 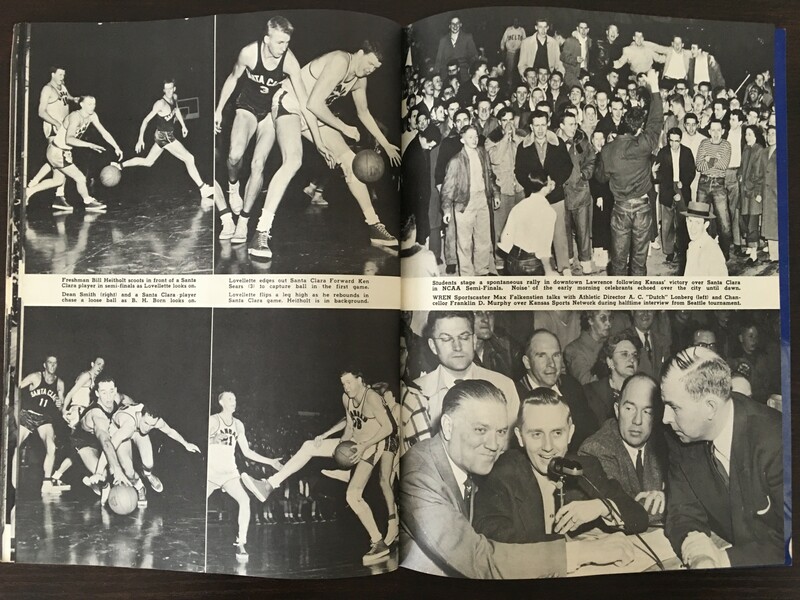 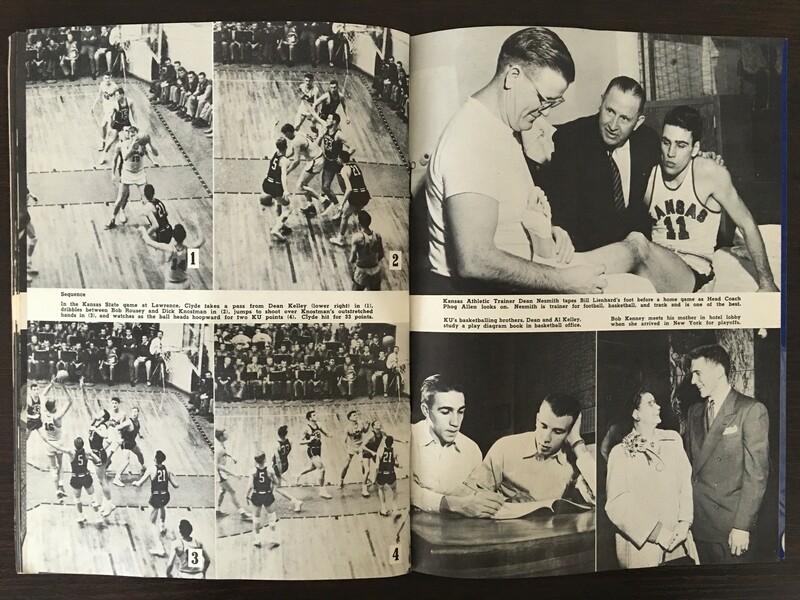 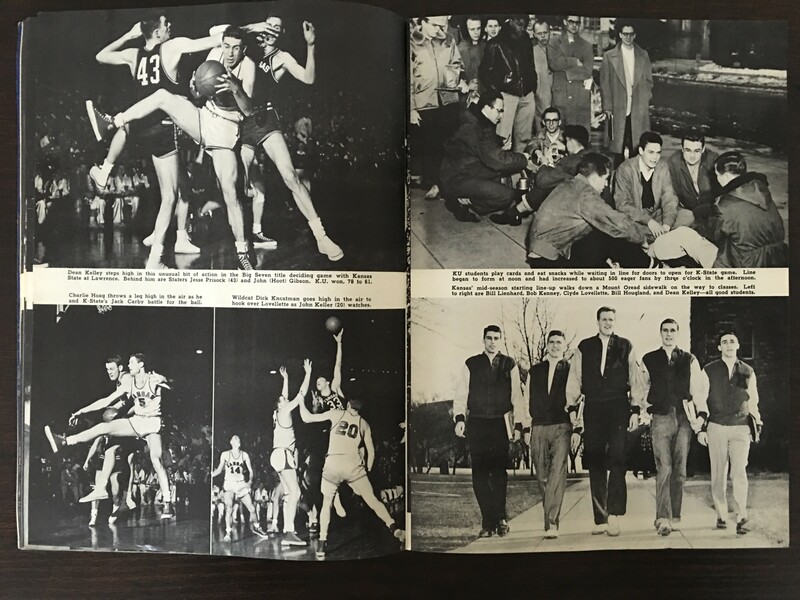 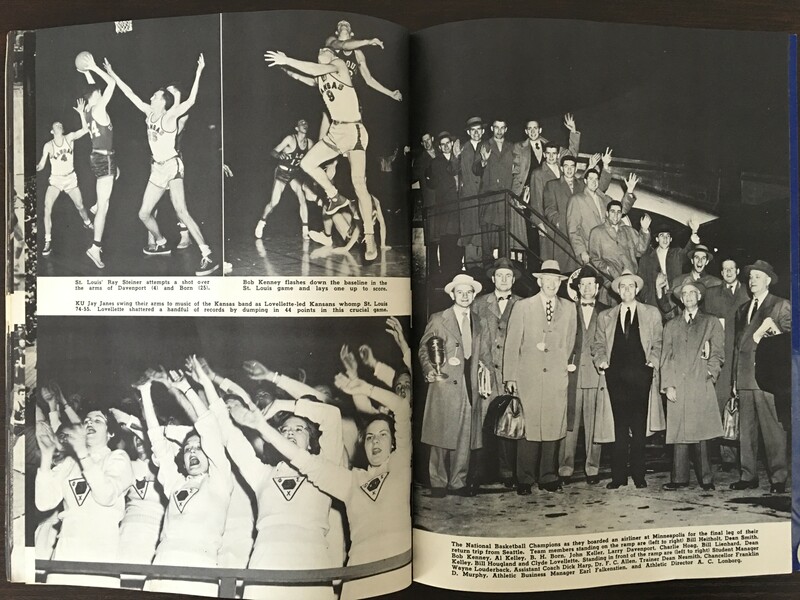 I don’t have anything that tells me who specifically took the two pictures you’re asking about, but the three photographers listed for the magazine are Jim Murray, Maurice Prather, and Rich Clarkson. 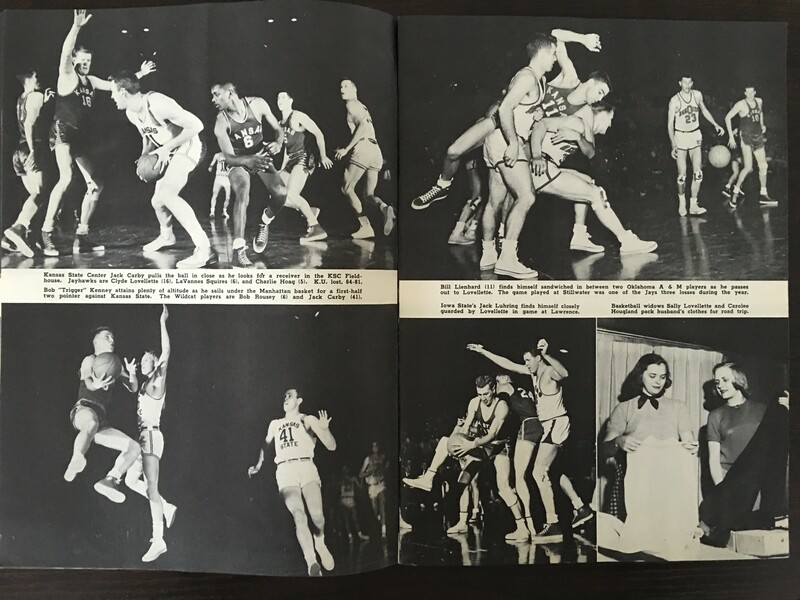 Jim and Maurice are deceased, but Rich had a long & extremely successful photography career and is currently in Denver, CO. 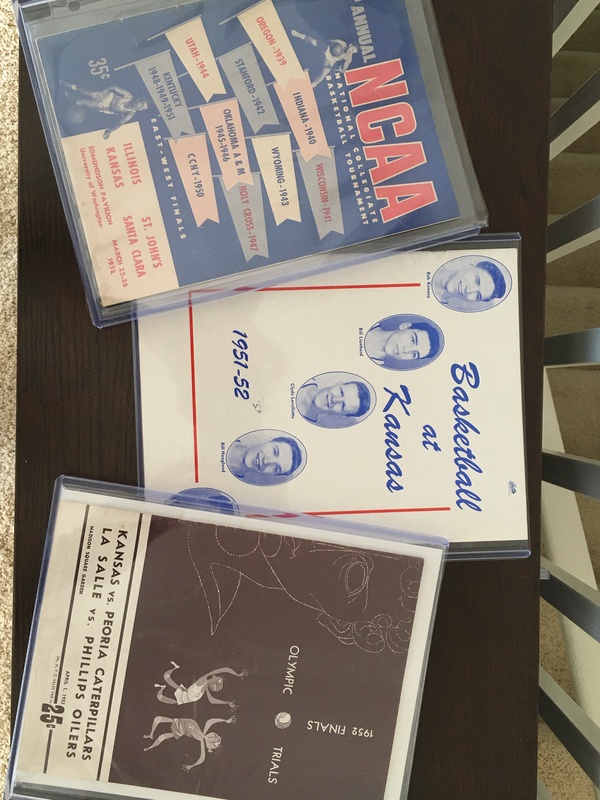 I would suggest reaching out to him via his company’s website: http://www.clarkson-creative.com/ as I bet he might have these pictures given the volume of outstanding work he did for/of KU. 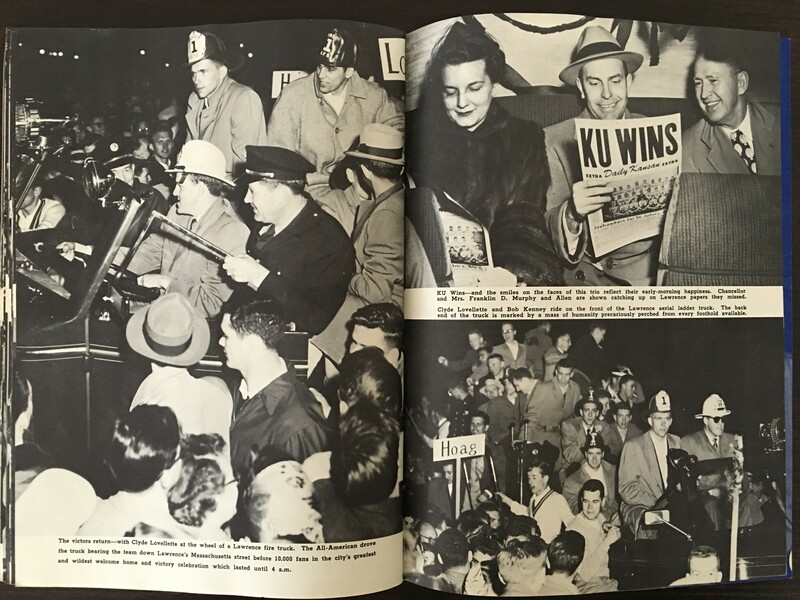 If that doesn’t work, let me know and I can try to connect you with a contact I have at the KU Archives, or – as a last resort – try to take as good of a picture as I can of those two shots to send to you.